Snowdon and Beddgelert.—Wednesday morning in Beddgelert dawned sunny and bright with many of us choosing to eat breakfast alfresco. Seven of us plus a dog drove to Llanberis and used the Sherpa bus service to Pen y Pass (free to Welsh bus pass holders!) for our walk along the Pyg track heading for the summit of Snowdon. It was warm and clear as we began our ascent on a relatively easy stretch. The views along the valley were excellent and we admired the craggy peaks around us. As we progressed the day got hotter and hotter, the paths are all reinforced with rocks so although you can hardly lose your way, it is unforgiving in heat. Frequent water stops were the order of the day. It was a sociable walk. We met students from Swansea University who had decided to see something of Wales before leaving. There was a party of 8 year olds from Birmingham which had left school at 7a.m. They had regular stops for refreshment but some of the children really struggled, the patience and support the teachers showed was amazing. Every one of the children made it to the top and was grinning from ear to ear when we talked to them about their achievement. Apparently for some of these children it is their first venture away from their home town. A lady walking alone turned out to be Belgian, a regular visitor to the area she had decided to go up alone since her husband was not fit enough. As we progressed our party stretched out maintaining visual contact with the person in front and behind us. As we climbed we looked down on the Miners track below as it wove its way past Llyn Llydaw and Llyn Glaslyn. We could clearly hear people shouting to one another as they played in the water, even though they looked like ants. The first peak we spotted wasn’t Snowdon but Crib Goch, another craggy summit. At Igam Ogam zigzag the path becomes a scramble up rocks as the Pyg and Miners tracks merge. and even the Saddleworth Moor fire outside Manchester were very clear. It was also our 1st view of the Snowdon Mountain railway, climbing the mountain at 45o angle here. After rest and refreshment (an apple proving a real pick me up) it was a short, steep walk on an excellent path to the summit, at 1085metres. It was like Piccadilly Circus at the top, with people staying to enjoy the views and the glorious weather. There was reminiscing about other times people had been up here with very limited visibility, we were well rewarded for our efforts today. A large cup of tea and a pasty from the cafe (£5) went down a treat. Then it was time to descend. We split into 2 groups; the first group taking the Miner’s track using walking poles to help them through the steep sections. They arrived at the bottom with time for a quick well earnt pint before getting the bus to Llanberis to collect the cars. The rest of us came down the Llanberis path which is a slightly longer but gentler route. We met a man who was completing the 3 peaks challenge – Ben Nevis, Scafell Pike and Snowdon in 24 hours. We also spotted a small tornado and grass fires started by sparks from the trains. At Halfway House we enjoyed refreshments and our first shade of the day in a strong breeze, wonderful. The lady who works here walks up from her farm daily and was planning to climb to the summit when she finished work at 5.30pm. Misty, the dog, had to rely on water fed to her until we were near the end of the walk when we found our first stream and she had a good wallow. Soon after we found the only other stream with a husky sat in it. Then we were meeting cyclists coming up, they are allowed to climb Snowdon after 5pm and it typically takes them 2hours up and 15 minutes down! We walked 7.5-8 miles and climbed 2372ft. The following day we went to a viewing point to appreciate our Snowdon walk before visiting Swallow falls and Bettws y Coed and then returned to Beddgelert to walk along Afon Glaslyn past Gelert’s grave. We stopped on a bridge to see the West Highland Railway steam train with its Pullman coach. The path becomes a scramble over rocks before reaching a car park. 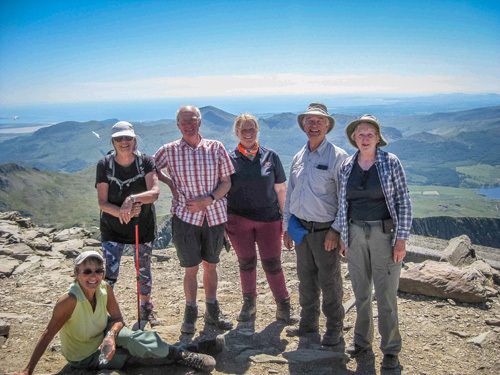 Most of us continued on uphill for excellent views of Snowdon and on towards Llyn Dinas before returning via a different stretch of the Afon Glaslyn which descends from the lake below Snowdon. (5.75miles) and another 1200ft). A couple of us doubled back early in order to try out the award winning ice cream parlour in Beddgelert regrettably the shop was closed by the time the rest of the walkers returned. It later transpired that Porthmadog, just down the road was 30.5o C on the day we climbed Snowdon and 33o C on our second day, the hottest anywhere in Britain so far this summer. Mad dogs and Englishmen springs to mind, though of course a few of us were Welsh.